It may seem ironic to have a discussion on conflict resolution in sports when sports are by their nature all about opposition. But sports officials deal with different types of conflict in the course of their duties, most frequently with coaches. A coach’s goal is to win. An official’s goal is to mediate fair play. These two goals often result in conflict, especially if a coach’s attitude is to win at all costs. So it’s not surprising that differences of opinion sometimes result in tempers flaring, harsh words being exchanged, and even physical altercations. But officials can approach these conflicts using the following approaches to effectively minimize or resolve clashes. Professionalism: Presenting yourself as a professional includes your physical appearance and knowledge of the game. Arriving to the event early in a clean uniform is the first step in making a good impression and gaining respect. Knowing the rules is paramount. 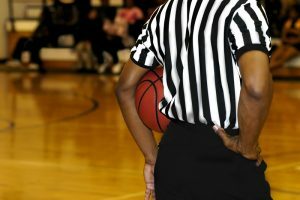 Officials can be excused for missing a call, but not for misinterpreting or misstating the rules. Coaches, players and spectators know when an official is prepared and working hard on the playing field. Approachability: While officials are the authority figure, players and coaches need them to be approachable when conflicts arise. Discussions should not be taking place over every call, but valid questions should be allowed to be voiced respectfully, which usually defuses tensions. Coaches who dispute a call typically just want to be heard, since reversals are rare. When agreements can’t be reached, the goal should be to at least agree to disagree so play can resume peacefully. A coach’s perspective of the issue is usually different from an official’s. It can be helpful to listen and let him or her know you understand their point of view, but are guided by the rules (see point 1) and that there are channels for lodging official complaints after the game. Communication: Approximately 55 percent of the information we communicate is transmitted non-verbally, which means we use facial expressions, eye contact, gestures and posture. A fuming coach may not be saying much, but his or her body language is speaking volumes. Officials should be paying attention to the non-verbal messages being relayed by players and coaches before they boil over and become verbally abusive or even physical in nature. Listen with your ears and your eyes. Emotional control: Conflicts often result in emotional responses that can even draw in people not directly involved in the issue, such as players and spectators. You can’t control how these people will respond to a situation, but you can control your own response. The responsibility of the official is to calmly settle confrontations, not become embroiled in them. This can be difficult when the official is the target of anger and blame. But counting to 10 before responding can go a long way in keeping things from escalating. Barking orders for coaches to calm down or get off the field or deflecting blame onto a fellow referee (“I didn’t make the call.”) erodes everyone’s respect for your authority and only serves to inflame an already tense situation. Humor: Poking fun at yourself or the general situation can be an excellent way to break up tension and win people over. It might not resolve the actual issue, but humor is is a universal stress reliever. This doesn’t mean laughing at the coaches or making light of a valid conflict, but laughing with the coaches put you on a level playing field and shows that everyone is doing their best in his or her role. Many of the tense situations referenced above should never occur in the youth or school sports context if coaches and parents follow the various codes of conduct that are published by governing and sanctioning bodies and similar organizations. Also, the suggested techniques can help to diffuse situations before they boil over. However, the reality is that heated disputes often occur in the sports context. A quick study of the loss runs of our sports insurance clients indicate too many fights and resulting serious injuries and lawsuits between officials and coaches or spectators. The alleged aggressor can either be the official or the coach or spectator. If the alleged aggressor is the official, such official will likely be seeking General Liability and possibly Accident protection through membership in a national association or coverage for officials under the local league policy. Claims may be unexpectedly denied by the General Liability carrier if the Assault & Battery exclusion is present on the policy. For that reason, we recommend that this exclusion be removed. Sadler Sports Insurance offers affordable, high quality Accident and General Liability coverage for umpire/referee associations. We offer instant online quote/pay/print for this type of coverage. Please visit our website or call us if you have any questions. Source: Jimm Paull. “Conflict Resolution and the Basketball Official,” Sportorials. January, 2016.